Is a Japanese Aikido instructor who lived and taught in many Western countries. He held the rank of an 8th Dan Aikikai. Sugano Shihan was born in Hokkaido. After learning judo for six years, around the age of 18, he went to train in Aikido. Sugano Shihan entered the Aikikai Hombu Dojo in 1957 and by 1959 was a direct student or 'uchi deshi' of O’Sensei Morihei Ueshiba. In 1965 he was appointed by O’Sensei to introduce Aikido to Australia. He remained there for 15 years, founding the organisation Aiki Kai Australia. At the request of Shihan Nobuyoshi Tamura, Sugano Shihan went to Europe, teaching in Belgium, Luxembourg and France. 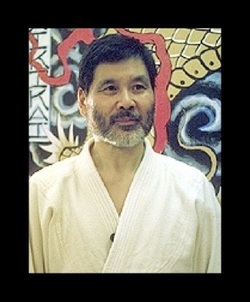 Then during 1988, he resided in New York City where he co-instructed with Shihan Yoshimitsu Yamada at the New York Aikikai. Sugano Shihan maintained a close connection with the Aikikai Hombu Dojo and also the Ueshiba family. He traveled extensively during the year to give Aikido seminars, mainly in Europe and South East Asia. He visited Australia twice yearly and Malaysia once yearly to conduct the National Training Schools and Dan gradings. Sugano Shihan’s Aikido was known for possessing speed, power and precision. His teaching emphasized timing and distance, within a fundamental study of basic technique. Weapons instruction followed a more organic style. Sugano Shihan’s weapons instruction focused on correct body positioning (hanmi) and paired practice, which again emphasized the necessity of timing and distance. Click on the Links adjacent for more interviews, articles and youtube links, on the Life of the Legend.